Four time major winner Laura Davies and Irish amateur legend Mary McKenna have seen just about everything in their storied careers in the professional and amateur game. Lisa MaguireYet they know they could witness the beginning of something special when the 14-year old Maguire twins, Lisa and Leona, rub shoulders with the cream of the European women's professional golf in the first round of the €500,000 AIB Ladies Irish Open at Portmarnock Hotel and Golf Links today. Less than six weeks after Shane Lowry won the Irish Open as an amateur, it is not beyond reason that the plus two handicap Ballyconnell prodigies can contend for Ireland’s first victory on the Ladies European Tour. Davies will be bidding to capture the €75,000 top prize, and her third Ladies Irish Open title following her wins at St Margaret’s in 1994 and 1995, in a field that features the top 40 money winners in Europe as well as a nine-strong Great Britain and Ireland Vagliano Trophy team that also includes Royal County Down’s Danielle McVeigh. Ms McKenna will captain the Vagliano Trophy side in Germany next month and the eight-time Irish Close champion sees no reason why the twins can’t give an excellent account of themselves. Ireland has 10 players in the field with Portrush amateur Stephanie Meadow joining Irish tour pros Rebecca Coakley, Marian Riordan, Martin Gillen, Hazel Kavanagh, Claire Coughlan-Ryan and Tara Delaney. Yet all eyes will be on the plus two handicap Maguire twins following their sensational start to the amateur season. Can they win? “If we do half as good as Shane Lowry did we will be alright,” said Leona, who has already won the French Under 21 and Helen Holm Scottish Strokeplay titles this year. The girls are determined to improve on their Ladies European Tour debut, when they missed the cut in the 2007 Northern Ireland Ladies Open as 12 year olds. “Hopefully we will do a wee bit better this time around,” said Lisa, who recently completed the Irish Women’s Amateur Close and Irish Amateur Open double. “There are a lot of good players out there and this is only our second European Tour event. It will be good to see the standard that’s out there and what where we can hope to be in a few years time." Teenage twins Leona and Lisa Maguire missed the cut in the €500,000 AIB Ladies Irish Open as big-hitting Swede Sophie Gustafson moved into contention for an incredible sixth victory on Irish soil at Portmarnock Links. Leona Maguire is used to rubbing shoulders with the top pros. 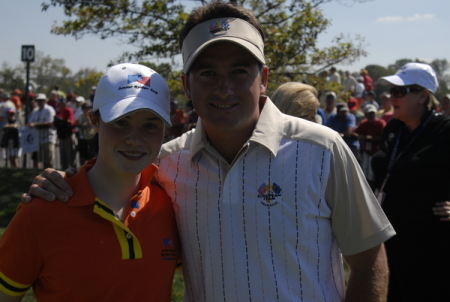 Picture hered with Graeme McDowell during the 2008 Ryder Cup at Valhalla. 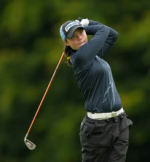 Credit: golffile.ieTeen twins Leona and Lisa Maguire will be gunning for glory on Ladies European Tour today. Leona, 16, was invited to play in the ISPS Handa Portugal Ladies Open at Campo Real near Lisbon as the reigning Portuguese Ladies Amateur Open champion. But the Cavan sensation also succeeded in getting an invitation for her twin sister Lisa for what will be their fourth start in a professional tour event. Slieve Russell twins Lisa and Leona Maguire have signed letters of intent to play for Duke University in North Carolina later this year.